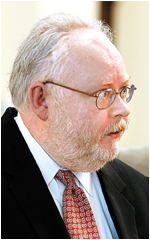 "This is a sad case," Circuit Court Judge Julia Hylton Adams told Lexington attorney Robert Treadway moments before sentencing him to 15 days in jail for his role in defrauding the president of Ale-8-One of nearly $70,000. Adams' sentence appeared to reconcile conflicting beliefs that Treadway suffered from a mental illness which may have contributed to his actions, and her belief that Treadway committed an "outrageous and egregious breach of trust," which deserved punishment. Treadway pleaded guilty in April to five counts of theft by deception, committed against Frank A. Rogers III and his investment company. Treadway billed Rogers for investigating and settling a fictitious planned lawsuit against Rogers' company. In court Thursday, Treadway apologized to Adams for his crime, adding he hopes his case demonstrates "the power of mental illness to wreck people's lives, as it has done mine." Treadway blamed antidepression medications he was taking for decisions to defraud Rogers between December 2002 and April 2003. "We've seen in some cases they cause more trouble than they solve, and that was the case with me," he said. He said he has been prescribed Prozac, Zoloft and, most recently, Effexor, for his mental illness. He added that he is not currently on medication for the first time in years. "I don't think they did me any good. They did me great harm," he said. "I would never have lost my judgment if not for the medication." Commonwealth's Attorney Thomas Smith disagreed, telling Adams that Treadway engaged in an "elaborate scheme" to defraud his victim. Adams agreed with that assessment to a point, telling Treadway, "There's no question you knew right from wrong." Nevertheless, she said it was clear to her that Treadway suffered from some type of mental impairment. In the end, Adams seemed to wrestle with what she called "a duty to the community, the victim and to the people who practice law." However, she pointed out that regardless of the sentence, Treadway will lose his license to practice law. Adams sentenced Treadway to five years in prison - one year for each count against him - but probated all but 15 days of the sentence. "In the blink of an eye, in a series of poor decisions, you set about to undo the course of your life's work," she told the Harvard Law School graduate. Treadway must report to the Clark County Detention Center July 26 to begin serving his 15-day sentence. Adams also ordered $70,000 paid by Treadway into an escrow account for restitution to be released to Rogers. Treadway also must maintain full-time employment, according to terms of his probation. He currently is working as a law clerk for a Lexington law firm.